Ubisoft has revealed its financials for the first quarter of the 2018/2019 fiscal year, which began this past April 1. The first quarter came to an end on June 31. Once again, Ubisoft reports that its titles find the most success on PlayStation 4 by a significant margin. PC comes in second, while Xbox One trails in third. The following graphic breaks down the sales by platform for this fiscal year’s first quarter and that of last year. There’s a slight decline in sales year over year for PS4. Meanwhile, Xbox One numbers remain the same; PC and Nintendo Switch see increases. The PS4 decline is worthy of note, since Far Cry 5 launched worldwide in March. A late June release for The Crew 2 could aid in explaining the lower sales, though. Ubisoft’s first quarter for the 2017/2018 fiscal year had more recent releases behind it. For Honor launched in February 2017, followed by Ghost Recon: Wildlands‘ March date. Or, perhaps, the explanation merely rests in PC and Switch gaining traction. Without hard sales numbers, it’s difficult to discern how much of a loss the percentages truly represent. Yves Guillemot, Ubisoft’s CEO, released a statement alongside the financial results. Guillemot celebrates the company’s continued growth. He additionally looks ahead to a bright future with Assassin’s Creed Odyssey and Skull & Bones on the horizon, both of which were well received at E3. We had a record first quarter, which exceeded our expectations. This performance was fueled by steady growth for our back catalog and an excellent momentum for PRI, once again confirming the increasingly recurring profile of our business and the ever-greater success of our digital transformation. Our teams are continuing to deliver on our strategic plan of ramping up our franchises. 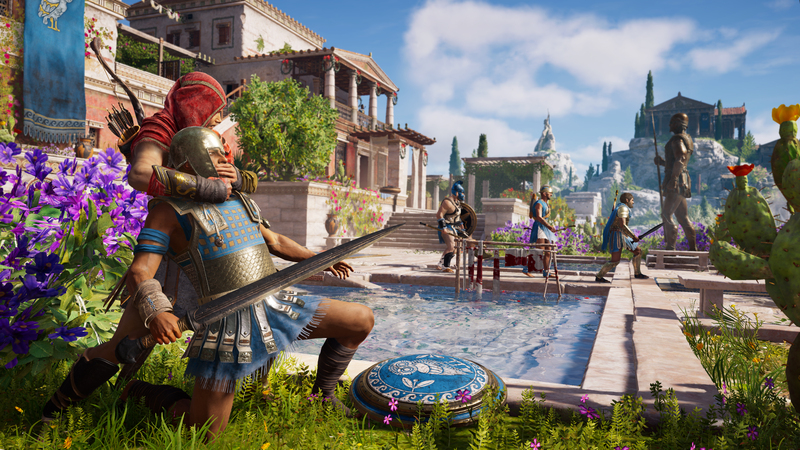 Assassin’s Creed Odyssey and The Division 2 were very well received at E3, confirming their full potential in a highly competitive environment. Our new creation, Skull & Bones, also made a very good impression due to its innovative gameplay combining naval battles with a multi-player experience. Thanks to its numerous growth drivers, brisk digital trajectory and close-knit relations with its gamer communities, as well as the fact that it directly owns its brands, Ubisoft is ideally positioned to meet its targets for full-year 2018-19 and continue to grow and increase its profitability over the long term. Fans of the publisher’s franchises has plenty to look forward to in the coming months. Assassin’s Creed Odyssey launches this fall on October 5. The Division 2 releases March 5, 2019. For now, Skull & Bones is without an official release date, however, it’s slated to launch sometime in 2019.